My last blog post, Down Time, was not the post I intended it to be. Sometimes even writing, I get unfocused and off-topic and my mind wonders someplace I never planned to be; kind of like in everyday life. Today I went to the kitchen for a bowl of cereal and ended up in the horse trailer for the bag of black licorice. In that particular post, I was going to mention the fact that it was suppose to rain on Sunday (80% chance!) and so we spent the entire NICE day of the weekend getting chores done. 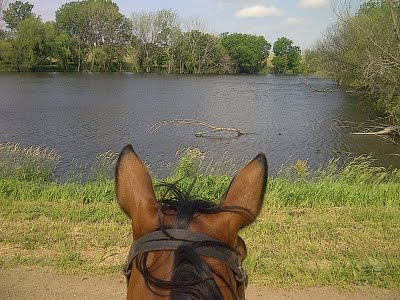 And then when the rain didn’t come (20% chance it wouldn’t), I took advantage of the mild weather and had one of the nicest rides on my horse. And it ended up going to the dogs… literally (the blog post, not the ride). So meanwhile, back on the “ranch”, I went out early Sunday morning and fetched Windy from the pasture and took her over to the trailer to tack her up. 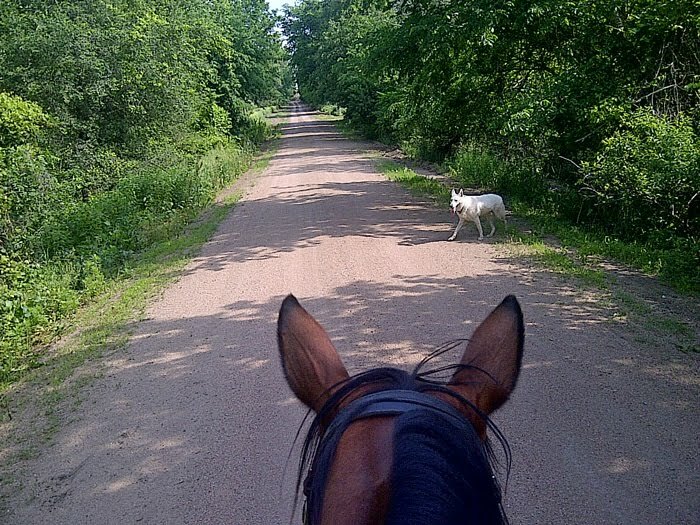 I haven’t ridden the roads here at home lately, so Ritz, my White Shepherd, was just beside himself. 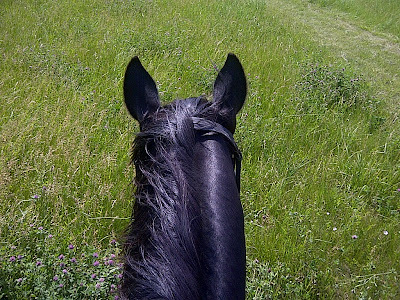 He loves to come along when I ride and lacks terribly in the patience department when I am saddling up. I have my regular routes that I ride around here; chosen mostly to avoid any highway riding. I am just fine with traffic on gravel roads but 65 mph highway traffic just scares me to death. I blame it on the movie The Horse Whisperer; can’t get the picture of the horse and semi out of my mind. And for the record, it’s me, not my horse. She couldn’t care less about traffic! I also avoid farmsteads that might have aggressive dogs both for the sake of horse and rider and Ritz. A few weeks ago I scoped out a new route in the car. I was pretty sure there were no homes along the way and the one dog that I knew about was pretty old and I was sure we could outrun him. On the last mile, there is the neighbor with the huge garden right next to the road. They have “Frasier” dog (the breed name escapes me) that is noisy, but not aggressive. Once again, if I put Windy into a nice trot or lope, we could quickly pass. It was time to explore. The old dog must have died or wasn’t interested in us. There was no sign of him when we past that farm. We had to then cross the highway to get to the next road. Crossing doesn’t bother me too much, as long as Ritz isn’t too far ahead. I called him back next to me as we checked for traffic and quietly crossed the pavement to what was a nice dirt minimum maintenance road. We flushed up some pheasants along this route; saw a deer off in the distance. The view from the top of the hill was beautiful this particular morning and definitely a route I would travel again. We turned at the next mile and followed the road that we had taken for the cattle drive earlier this year. I hadn’t noticed the pond then – it was probably covered with ice or snow at the time, but today was the color of the sky and very inviting to Ritz. Instead of turning for home at the next mile, I continued down yet another minimum maintenance road that we used to ride more often. It is a shade covered road, lined with mulberry trees. Years ago, the farmer who leased the property gave us permission to ride the creek beds and tree lines around the fields. After its owner died, the property went up for sale. We entertained the idea of buying it, but once up for auction, the opening bid per acre was more than the max we could have paid. Some “city-folk” snatched it up and quickly put up fences and “no trespassing” signs. They can keep me off their property but not off the roads and I enjoyed a brief ride down there that morning. Later, I went and took Blue out for a short ride. I think he has only been out once this entire year and he made me work for it this time. His feet were going forward but his mind was on the mares left behind. That’s his black ears at the top of this post. On another subject (see how the mind wonders? ), I was reading Saddle Up Nebraska magazine, a regional publication for horse owners. There was a small ad asking for readers to submit their favorite pictures for publication. 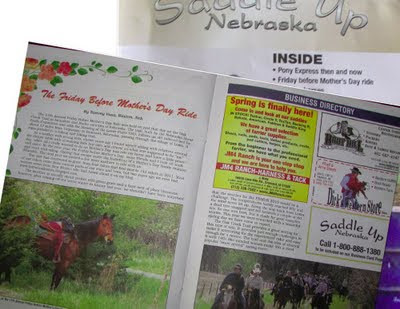 I love the picture of Windy which I took at the Friday before Mother’s Day Ride (shown in the header of this page) and submitted it to their photo editor. She liked it and asked where it was taken. Via email, I told her about the Friday before Mother’s Day Ride and the history of the ride. It’s never hard to get me talking…. A few days later, I got an email back from the photo editor who said her editor liked the story about the ride and asked if they could use it. I was flattered and this first story was published in their June edition. I shared a few more emails with the magazine’s editor and was asked to submit a story for the next issue. I have to admit, it was a bit harder writing “on request” than it is when I write for fun. But I liked the challenge and the opportunity. I’m excited that the editor has just accepted my second story for publication. love the tree lined road. Reminds me what I rode in my youth! Congrats on the article. It was great! and Windy is always a gorgeous horse. Congratulations on getting published! That is wonderful! You must be so proud! Keep submitting. You're a great writer. Always funny. I had to crack up, as usual, when I read that you went to the kitchen for bowl of cereal and ended up in the horse trailer with the black licorice! That one road looked great. It looked like you could just run down it for miles! Congrats on writing for the local paper and having them want a photo to boot!That is a nice photo. I'm looking for opportunities like that too. 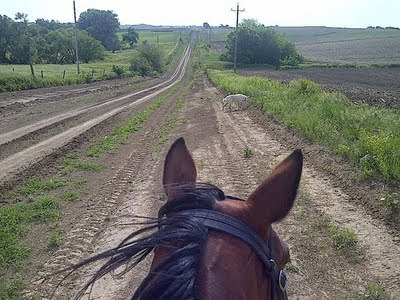 How great to be able to head out from home and have those places to ride with your dog. Not that I would trust either of my dogs. Ack, does Ritz do the squeaky excited "hurry up!" bark while you're trying to saddle and mount? Cersei does that - it's almost cute but soooooo annoying! Lovely ride! And congrats on getting published - that's awesome. You're a great writer. Your trail ride hack sounds wonderful! Grats on the publication! It's tough to break into magazines, so use this to your advantage and you could even eventually turn it into a paying freelance gig for bigger mags. Lovely photos and it looks like you had some fabulous weather to ride in! Hi I found you from allhorsestuff blog. It looks like you had a great ride, and your dog is so well behaved any of our dogs would go wandering off and get themselves in some sort of trouble. Congratulations on having your story published. Beautiful ~found myself longing for those long stretches of dirt roads! Love where you live...even if you have to wait so long to get out there, for snow. Congrats too...your writing is really great, always takes the minds eye to such an equine enchanted time! Giggled too...you and Windy mare, outrunning the beasts!